Getting away from dark landscapes and fiery outfits for a short time, I've decided to post an outfit my low level Lore-master uses. It's not often I've focused on the Draigoch armor skins--I usually use gloves and boots to accessorize--but I discovered that my main Lore-master and my Warden still have their sets sitting in storage. Just that tiny bit of nostalgia, and the fact that my kin has been running Draigoch lately, was enough to motivate me. 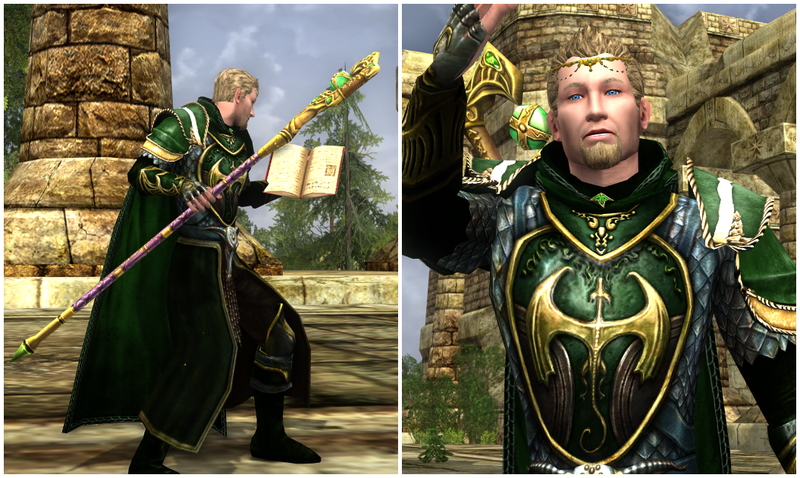 Other than that, and the fact I'm trying different gear combinations, there's really no story to this outfit. In the meantime, I've been working on my Simple Fashion series, trying to find hauberks, tunics, and robes that I've either never used or seldom used. Progress has been slow, but I'm moving towards a new entry for that series in the future. I've been busy focusing on content. I'm also adding to my Cosmetic Weapons Project. Part of me has been dreading it due to the significant time sink, just wanting it to be completed, while the other part of me has been waiting to uncover all of those unused weapon skins hidden in the database. I've made sure to take my time that way I can avoid a burnout...but a burnout happened anyway! On a side note, looking at these pictures makes it hard to believe the transformation that Bree-land received with U22. Having this outfit sitting in my blog backlog for so long (since January, at least) and then posting it well after the update released makes it feel surreal. The landscape just doesn't feel the same, especially with natural boundaries and a overall flatter landscape. The Brandy Hills, where I took these pictures, has remained relatively untouched. 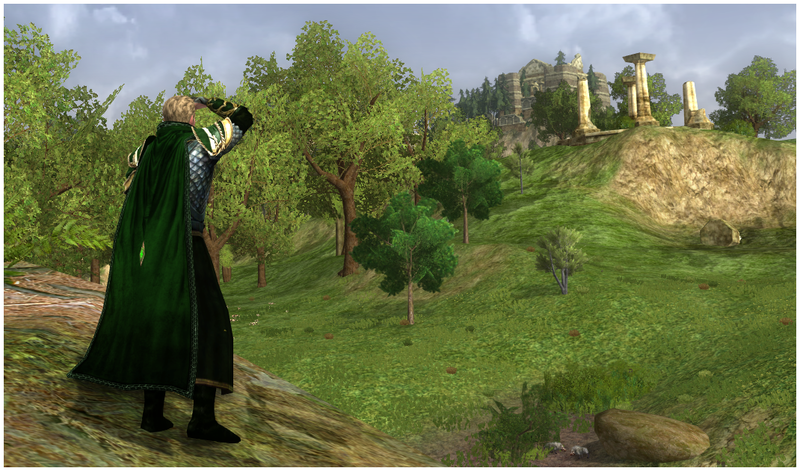 The Old Forest, the Barrow-downs, and Starmere Lake, to name a few locations, have seen major graphical overhauls. I love the changes, don't get me wrong, but there will always be a special place in my heart for the classic landscape. 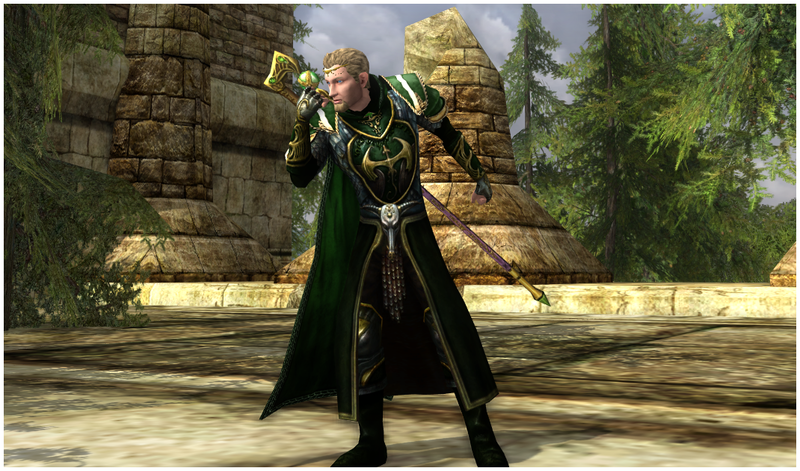 **Legolas' Cloak from the Anniversary Scavenger Hunts makes a great alternative, considering the Cloak of the Unwelcome Guest comes from one quest and one quest only. 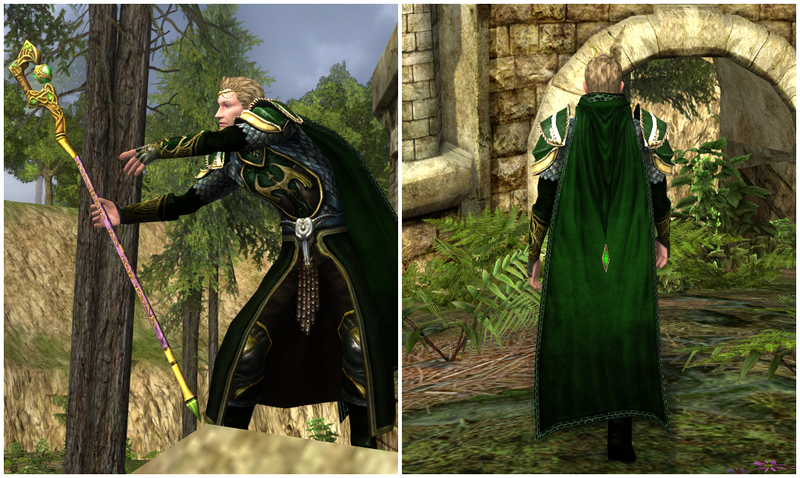 Legolas' Cloak has some subtle leaf embroidery masked easily by darker colors.